I'm fairly sure this is a series, or at least more than 1 book. I remember bits and pieces. There is a space ship, I think it's family run and is a cargo ship. There is an alien race that I think is described as smelling like cinnamon. There is an amorphous entity tied to one of the aliens. The alien dies and the entity is forced to bond with a human male. They have a hard time adjusting to each other but the entity facilitates the ship to go faster/navigate better or some such benefit. Either late in that book, or later in the series, if it is a series, the human ship ends up in a region of space where they get "stuck". Their engines either don't work or can't get free of the space. Come to find out that region of space is a giant entity that used to be bonded to the amorphous entity that bonded with the human. The space entity teaches the bonded entity how to release the human without killing him. The 2 entities go off together. I think I read this back in high school, so between 2000-2004, but the book may be older, I don't know. You may be thinking of Man of Two Worlds by Frank Herbert & Kevin J. Anderson. On the distant planet Dreenor lives the most powerful species in the Galaxy. All of the Universe is the creation of the Dreens, who possess the power of "imaging" [sic - it's actually "idmaging"], turning their thoughts into reality. They can create whole worlds, of which the wild, ungovernable planet Earth is one. But suddenly Earth is a threat, its people on the verge of discovering interstellar travel, and with it, of gaining access to Dreenor itself - a paradox within a paradox, not to be permitted. While the elder Dreens plan Earth's destruction, a youngster, Ryll, embarks on an unauthorized jaunt across space. Forced for survival to merge bodies with an “Earther” whose mind is as strong as his own, he has to battle for control. And the future of all earthly life lies in the hand of a composite being, half wily, aggressive human, half naive adolescent alien, confused and far from home. The story involves a race of blob-like aliens (the Dreen) who can alter reality with the power of thought (called "idmaging"), and had done so in creating Earth and humanity. Now, humanity is on the verge of discovering faster-than-light travel, allowing them access to the Dreen's other creations, and Dreenor itself - and the Dreen debate destroying humanity, believing them too barbaric to have this kind of access. The story begins with the main human character, Lutt Hansen Jr. in his personal transport ship colliding in FTL space (they call it "spiral space" IIRC) with a Dreen ship (using its superior "vorspiral" drive). The only way either can survive is if the Dreen, Ryll, can merge his consciousness, parasite-like, to Lutt's, creating a single entity. A quick search of my eBook didn't have the word "cinnamon" anywhere but there are references to the Dreen being able to detect one another by smell, even when piggybacking in a human consciousness. 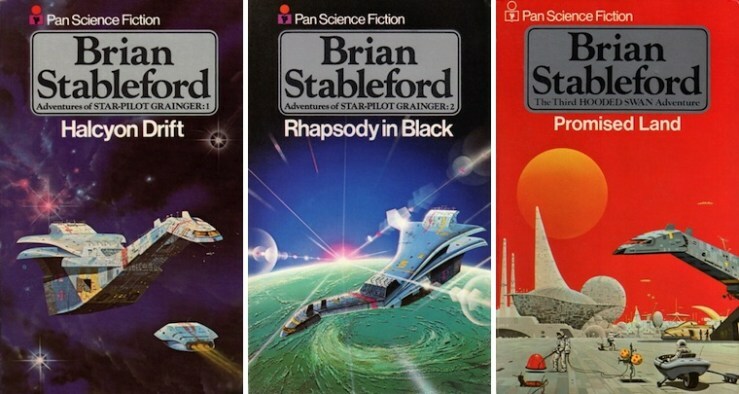 It sounds like it could be Brian Stapleford's Hooded Swan series. In the first book, The Halcyon Drift, a starship pilot called Grainger (a pacifist antihero) is marooned on a desolate planet where his mind is invaded by a mind symbiote-slash-parasite called the Wind. When rescued, he is more or less forced to take a job flying the experimental starship The Hooded Swan on a series of missions to pay off a debt. 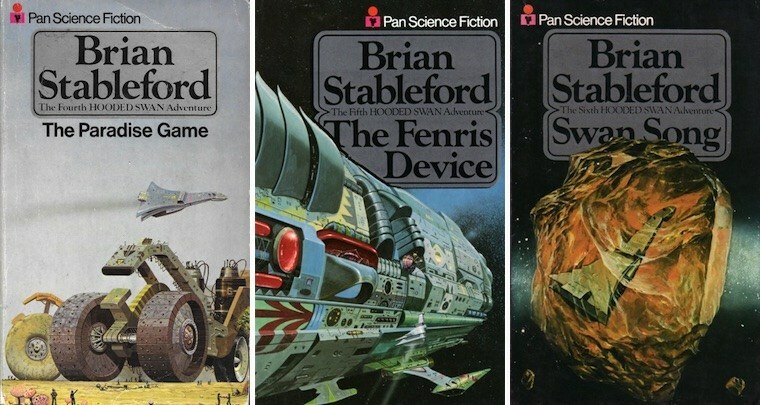 These missions constitute the six books in the series. Not the answer you're looking for? Browse other questions tagged story-identification books aliens spaceship or ask your own question.